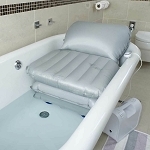 Mangar Health is a world leader in the design and manufacture of inflatable moving and handling and bathing equipment and has been helping people with their independence, dignity and an improved quality of life since 1981. Mangar Health is an award-winning organization, proud to serve a global healthcare market. 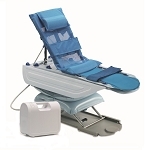 Caregiver Products is proud to supply cushions, bathers, bath lifts, and more by Mangar Health. Lightweight, inflating bed wedge designed to assist people who need help to rise from lying to sitting. Elevating bath lift with battery powered compressor for children. 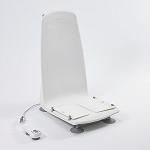 Comfortable, easy to install, and easy to operate bathtub lift. Easy to use, inflatable lifting cushion and supportive back rest.